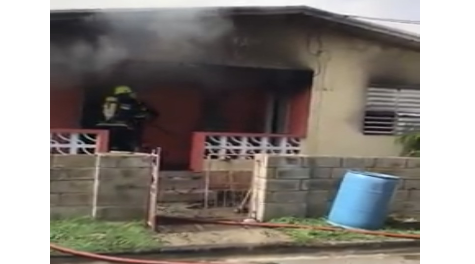 St Kitts and Nevis (WINN): A family of four is currently counting their losses after their two storey house in Bird Rock was damaged by fire. Fire Chief, Everette O’Garro told WINN FM that Fire and Rescue Services received a call at about 11:45 a.m. about a fire at a residence on Robin Street. Fortunately, no one was at home when the fire started as the two adults were at work. Reports surfaced that the house had been burglarized and the fire may have been deliberately set. However, the fire chief could not speak to any early signs of what may have caused the blaze. However, police sources confirmed that after the fire was extinguished, it was realized that there were signs of a break-in and electronic items were missing. Police are investigating the circumstances surrounding the alleged burglary and arson incident.